The heart suddenly and unexpectedly stops beating. Blood stops flowing to the brain and other vital organs, and without treatment, within minutes a person is typically dead. But, a new study has suggested that sudden cardiac arrest isn’t so sudden as half of sufferers experience warning signs hours, days, sometimes even weeks before cardiac arrest strikes, doctors at Cedars-Sinai Heart Institute in Los Angeles discovered. However, most people ignore those symptoms – and miss a chance to save their own lives, according to the study. Study leader Dr Sumeet Chugh said: ‘By the time the 911 call is made, it’s much too late for at least 90 per cent of people. 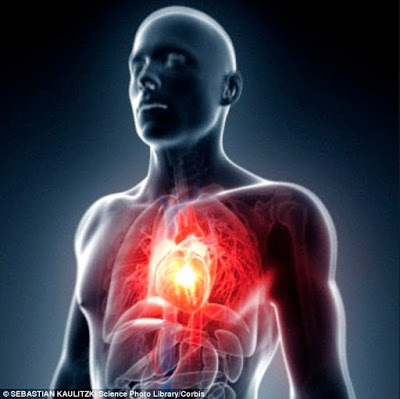 The study offers the possibility of one day preventing sudden cardiac arrest. Cardiac arrest kills nearly 350,000 people in the US alone each year. Though it’s commonly confused with a heart attack, cardiac arrest is different – and much worse. It causes the heart’s electrical activity to be knocked out of rhythm, abruptly stopping it from beating. CPR can buy time before an ambulance arrives, but few patients survive. As a result it’s been hard for the medical community to tell whether cardiac arrest is a strike with little or no advance warning. Scientists closely tracked sudden cardiac arrest in Portland, Oregon for more than a decade. They examined records for nearly 1,100 people aged 35 to 65 who suffered a cardiac arrest between 2002 and 2012. They also used interviews with family, friends and strangers who witnessed the patient’s collapse. For around a quarter of patients, the scientists couldn’t find any information about whether they experienced symptoms – making it tough to say how common warning signs are. However, of the remaining 839 patients, half had evidence of at least one symptom in the previous month. Most of those people had symptoms within 24 hours of their collapse – though some came a week before and others up to a month. Chest pain was the most common symptom in men. While women were more likely to experience shortness of breath. Other symptoms included fainting and heart palpitations. Furthermore, the study found that only a fraction of patients considered their symptoms bad enough to call 911 before they collapsed and those people were the most likely to survive. A person’s chances of experiencing cardiac arrest is also increased if they’ve had previous heart attacks, coronary heart disease and certain inherited disorders that affect heartbeat. 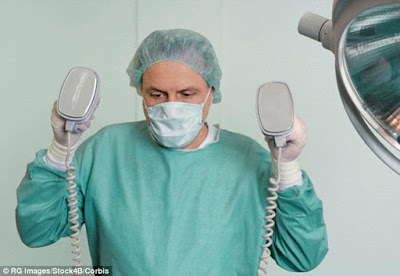 People who know they are at a high risk may receive an implanted defibrillator to shock their heart back into rhythm. But because cardiac arrest is such a public health problem, the Institute of Medicine kicked off a national campaign to teach CPR last summer, so that bystanders know how to help. Dr Chugh and his team weren’t able to determine symptom severity. The patients who called 911 about their symptoms were mostly already diagnosed with heart disease or had recurring symptoms. Those patients’ survival rate was 32 per cent – compared to six per cent for other patients. That’s because a fifth of the patients who called 911 had their cardiac arrest on the way to the hospital. This study is just the start of more research to better predict the risk factors for cardiac arrest – and to figure out how to target them without panicking people – Dr Chugh said. The study was published in Annals of Internal Medicine.